It's roughly 10 weeks since RC1 and five weeks since RC2 and thanks to valuable community feedback, there have been improvements and bug fixes. The uptake of Joomla! 1.5 has been incredible, with many people diving in to the new API and finding ways to make it sing. The current Joomla! 1.5 template competition has further fuelled interest, as has the number of 1.5 native extensions finding their way onto the Joomla! Extensions Directory. Joomla! 1.5 is really gaining momentum. Joomla! will be presented for the first time in Joomla!Day format for Joomla!Day USA (East) in New York, next month. So if you're a Joomla! devotee, this is an event not to be missed. Inspired by the incredible success of J!Days East Coast and Central, New York looks set to be even more successful. The event is open to anyone, and will be taking place in the heart of New York City, at Google's East Coast headquarters on Saturday, October 13, 2007 — 9.30am-5pm ET. If you don't know Joomla! then this event is for you. If you do know Joomla! it's for you too! If you want to learn how to launch a website in minutes for a business or other endeavor, this event will provide you with the foundations of how to manage the world's most popular open source content management system. If you want to write code for Joomla! you will also be able to meet fellow coders and meet some of the people responsible for creating Joomla! 1.5. Joomla!Days are for anyone who wants to learn, create and improve their skills. Joomla! 1.5 RC2: Endeleo - Happy Birthday Joomla! Joomla! 1.5 RC2 [codename: Endeleo] is now available for download. What better way to celebrate our 2nd Birthday! We chose Endeleo as the codename for this release candidate as it is Swahili for 'development, growth, progress ... improvement'. Highly appropriate we feel. Read more: Joomla! 1.5 RC2: Endeleo - Happy Birthday Joomla! With the release of the eagerly anticipated Joomla! 1.5, the time has come to allow one of the skilled designers in our midst to become apart of the success that will be Joomla! 1.5. The Joomla! 1.5 Template Contest is open to anyone with a passion for design and a desire to have their design seen and used by millions of people globally as theydownload and install the stable release of Joomla! 1.5. The five finalists will each receive a Joomla! prize package that includes a Joomla! laptop bag, Joomla! shirt, Joomla! hat, and a Joomla! 256MB USB memory stick. 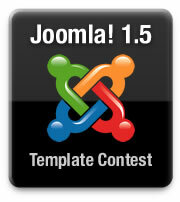 The grand prize winner will have his/her template added as the third template to the Joomla! 1.5 core distribution to be downloaded in every Joomla! 1.5 package. Do you want to look sensational? Joomla! today announces the launch of two newproducts with the Joomla! embroidered logo in its official merchandise range. You can now proudly show your Joomla! colours with an official Joomla! Cap, ourJoomla! Laptop Bag, or both! We hope these new products will provideJoomla! fans with a strong visual statement to demonstrate their support. Allprofits from our online shop go back into the project to further itsnot-for-profit aims and ambitions. Look cool and support Joomla! at thesame time.